Why is there so much death and disease among sea life living near the west coast of North America right now? Could the hundreds of tons of highly radioactive water that are being released into the Pacific Ocean from Fukushima every single day have anything to do with it? When I wrote my last article about Fukushima, I got a lot of heat for being “alarmist” and for supposedly “scaring” people unnecessarily. I didn’t think that an article about Fukushima would touch such a nerve, but apparently there are some people out there that really do not want anyone writing about this stuff. 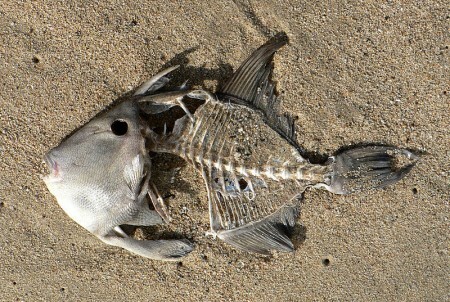 Right now, massive numbers of fish and sea creatures are dying in the Pacific Ocean. In addition, independent tests have shown that significant levels of cesium-137 are in a very high percentage of the fish that are being caught in the Pacific and sold in North America. Could this have anything to do with the fact that the largest nuclear disaster in the history of mankind has been constantly releasing enormous amounts of radioactive material into the Pacific Ocean for more than two years? I don’t know about you, but to me this seems to be a question that is worth asking. Divers were out in Puget Sound waters Saturday to see if they can help solve a mystery. Scientists are trying to figure out what’s causing one species of starfish to die in parts of Puget Sound and the waters off of Canada. The same thing is happening in the waters near Canada and nobody’s sure why. If scientists don’t know why this is happening, perhaps there is an unusual explanation for this phenomenon. That certainly does not sound normal to me. Shouldn’t we be trying to figure out why this is happening? I am just asking the question. What would cause the Pacific Ocean to be “dead”? When you consider the evidence presented above along with all of the other things that we have learned in recent months, it becomes more than just a little bit alarming. –Along the Pacific coast of Canada and the Alaska coastline, the population of sockeye salmon is at a historic low. Many are blaming Fukushima. –Something is causing fish all along the west coast of Canada to bleed from their gills, bellies and eyeballs. Is it really so unreasonable to wonder if Fukushima could be causing all of this? The latest releases appear to be carrying much more contaminated water than before into the Pacific. And that flow may not slow until at least 2015, when an ice wall around the damaged reactors is supposed to be completed. The magnitude of the recent spike in radiation, and the amounts of groundwater involved, have led Michio Aoyama, an oceanographer at a government research institute who is considered an authority on radiation in the sea, to conclude that radioactive cesium 137 may now be leaking into the Pacific at a rate of about 30 billion becquerels per year, or about three times as high as last year. He estimates that strontium 90 may be entering the Pacific at a similar rate. Right now, approximately 300 tons of contaminated water is pouring into the Pacific Ocean from Fukushima every 24 hours. But apparently we are not supposed to ask any questions about this and we are just supposed to blindly accept that this is not having any significant impact on our environment even though sea life in the Pacific appears to be dying in unprecedented numbers. I don’t know about you, but I really think that the people of the world deserve to know the truth about what is happening out there.